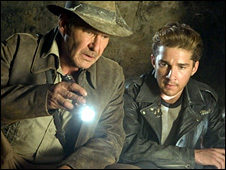 Steven Spielberg has said he is happy to make another Indiana Jones movie if fans enjoy the long-awaited fourth film, Kingdom of the Crystal Skull. 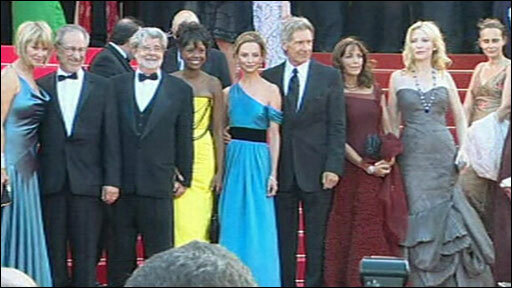 The director joined stars Harrison Ford, Cate Blanchett and Shia LaBeouf at the film's premiere in Cannes. Asked at a press conference if he wanted to make another film, he said: "Only if you want more. "That's why we made this Indiana Jones. We'll certainly have our ear to the ground to hear what happens." Spielberg added: "That'll decide were we go from here." The film attracted the likes of Natalie Portman, Sean Penn, Goldie Hawn, Salma Hayek, Dennis Hopper, Christian Slater, Billy Zane and Kelly Brook to its showpiece screening. The BBC's Mark Savage said it was "very much in the style of the first three films. The set-piece stunts are second to none. "There's also a sly acknowledgement of internet rumours that Shia LaBeouf will take over the franchise," he continued. Early reviews have been mixed - British movie magazine Empire's Damon Wise said it was "a slick, fun film", while the Daily Telegraph's David Gritten called it "undeniably creaky". But leading man Ford, now 65, said he was not afraid of what critics thought. "I expect to have the whip turned on me. It is not unusual for something that is popular to be disdained by some people and I fully expect it," he said. "I'm not really worried about it. I work for the people who pay to get in - they are my customers. "My focus is on providing the best experience I can for those people." 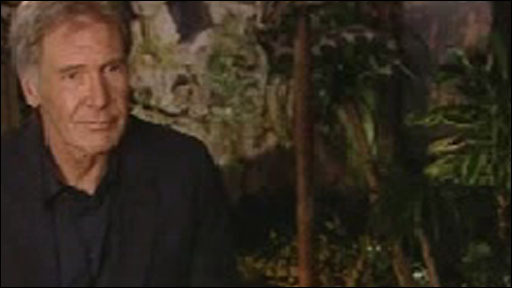 Ford, who made his debut in the role in 1981's Raiders of the Lost Ark, described the new film as a "celebration of the movies". He added that he was delighted to see it create such a stir at Cannes, with fans holding up signs saying "need Indy ticket". "I'm delighted that we have the opportunity to release a film now because for a couple of generations, young people have just been seeing this on DVD at home," he said. "Now we get the chance to see it in the cinema, where it's meant to be seen. I'm very excited about that." The film opens in 1957 at the height of the Cold War, and that the hero is on the search for a skull stolen from a lost city and guarded by the living dead. Spielberg tried to make the film using old-fashioned B-movie techniques, rather than computer graphics, in keeping with the original trilogy. Scenes in the trailer show Ford make a joking reference to his age. "This isn't as easy as I remember," he quips. The movie has its UK release on 22 May.